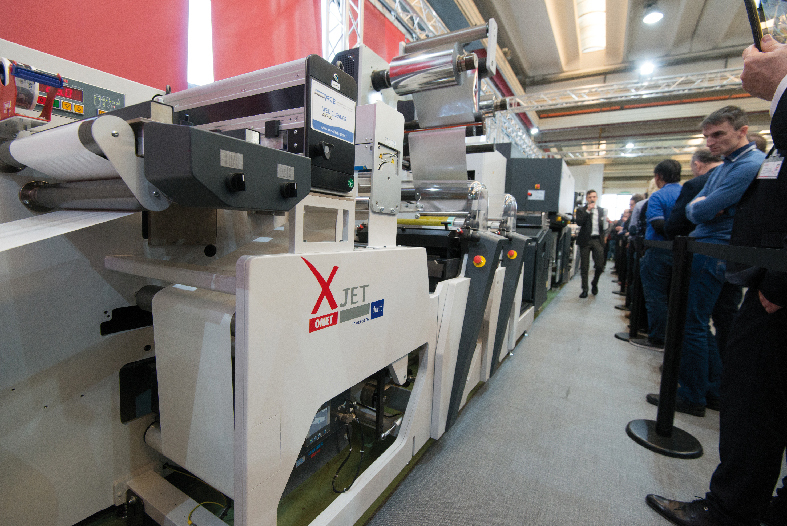 “OMET Hybrid Experience” has attracted the attention of over 250 operators in the sector, customers and partner companies, who have made successful the event dedicated to hybrid label printing; focus on OMET XJet powered by Durst, which is becoming more and more established in the label printing market, as evidenced by the important commercial results obtained worldwide. On this occasion “OMET DROME” was inaugurated, a permanent space, located in the Molteno plant, a few kilometers far from Lecco headquarters, dedicated to live demonstrations. And in Molteno it is planned in 2020 the inauguration of a new factory of 35.000 sm, equipped with an automatic warehouse, 17.000 sm for production, 4000 sm for offices and an area of 5.000 sm square meters for the new demo center and the research and development area. During these two days, visitors were able to watch live demonstrations on: OMET XJet powered by Durst and iFlex in hybrid configuration with UV and LED drying devices. 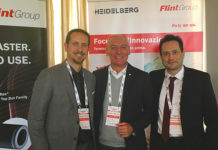 The event was supported by sponsor companies that actively participated in the event: Apex, Asahi, Avery Dennison, Control Technique (Nidec Group), Erhardt + Leimer, GEW, Kurz, Italfinance, Ritrama, Rossini, Rotometrics. Swedev, Tesa, Vetaphone and Zeller + Gmelin. Paolo Grasso, manager of OMET Labels BU, provided an overview about flexo+ digital combination, considering the demands of the market. “Today brand owners demand the customization of the packs without compromises in terms of print quality, having traditional technologies as a point of reference, but they are not willing to pay extra costs for an added value that unquestionably only digital printing is able to provide. On the other hand, the printer is looking for new technologies to expand its offer, but with a careful and watchful eye on costs. Having a modular platform capable of responding to different needs is undoubtedly very much appreciated by printers who can thus choose which type of technology to offer to their customers according to different market needs. Another aspect to take into consideration is the possibility of creating new targets and new markets by proactively approaching the customer”, says Paolo Grasso. The concept of hybrid machine offers a series of advantages thanks to the mix of technologies that are enhanced by this combination in a single line: with inkjet you can print small and medium runs, customized with variable data, being able to reproduce the 95 % of the color range, while thanks to flexographic technology we guarantee the reproduction of Pantone, uniform printing of solids, coatings and all finishing and converting operations, obviously with the great advantage of performing all these steps in line on the same printing machine. 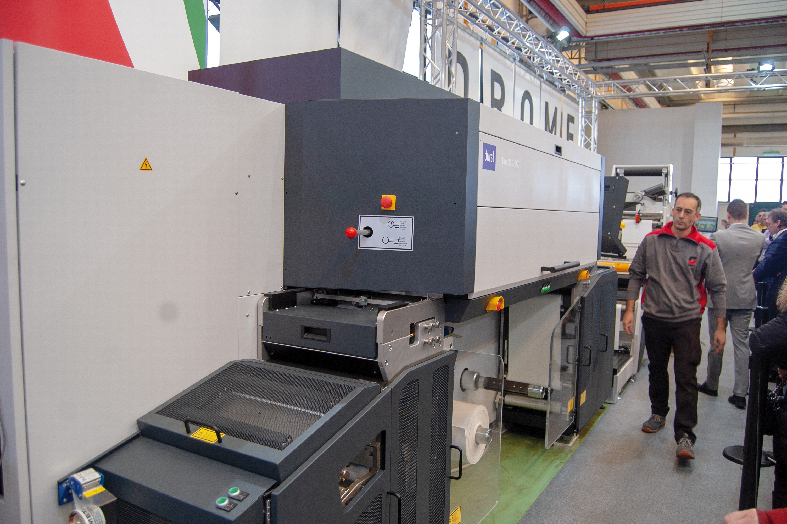 The system proposed by the partnership between OMET and Durst is completely modulable, based on direct drive transmissions that guarantee maximum register stability for high quality printing results. Depending on the requirements, it is possible to insert hot-foil, cold-foil and lamination module, screen printing, printing on adhesive, Monotwin Cut die-cutting unit and Rock’n’roll waste removal unit. 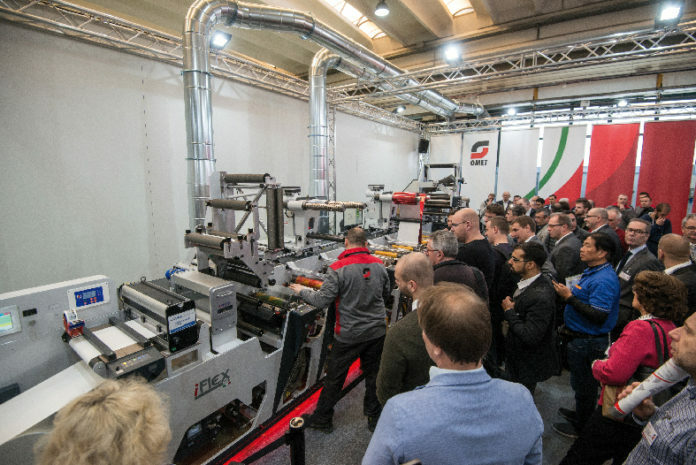 The other technology present in the new OMET Drome was an iFlex, introduced at Labelexpo 2015 and soon become one of the most appreciated machines of the Lecco manufacturer, thanks to its simplicity of use without any compromise from the qualitative point of view. Among the main features we report the iLight laser pre-register system that guides the operator towards perfect alignment of the plates with a simple rotary movement of the knobs outside the cylinder. As a demonstration of the real simplicity of this gesture, during the press demos, these adjustments were made by some randomly chosen people in the audience. Always to guarantee a perfect register, the iFlex mounts the iVision system, composed of a set of smart cameras positioned on all the printing units that allow the operator to check the register color by color, in real time. Sergio Veneziani, PM for Ritrama’s Linerless products, has introduced the partnership between OMET and Ritrama for the development of the Core Linerless Solutions® project. An innovation that allows significant savings, speed and a positive impact on both efficiency and environmental sustainability of the printing process of self-adhesive labels. “The management of the liner (siliconized support) is a challenge that we can now solve with the Core Linerless Solutions® technology platform, using a self-adhesive material with a multifunctional smart liner. 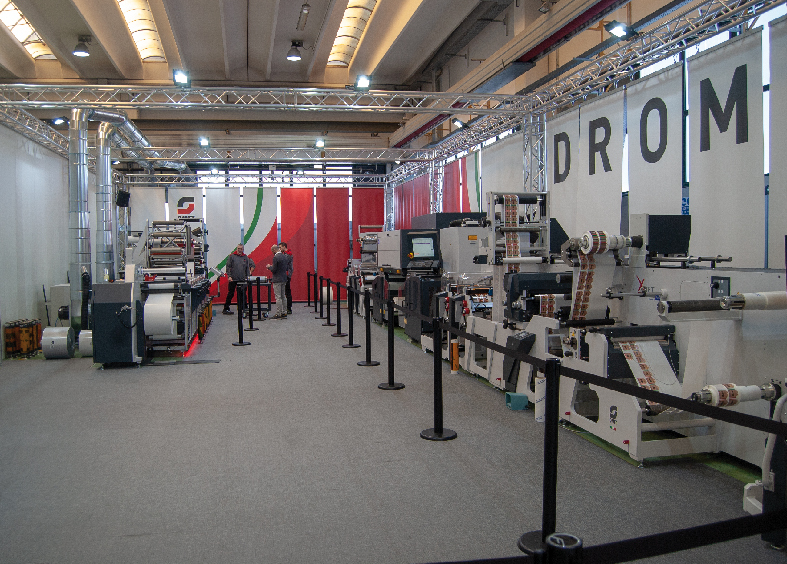 At the beginning of the production process, the self-adhesive material is equipped with its liner which, during the converting phase, becomes a component of the label (laminating film), thus passing from waste to an integral part of the laminated film”, says Veneziani. This material consists of: OPP TC printer surface suitable for any type of printing, permanent acrylic adhesive, silicone liner and thermally activatable adhesive for a final label of 42 microns plus the adhesive layer, ready to be applied by special labeling modules on the final products. “This is not a product but an innovative technology that can change the paradigms in the production of self-adhesive labels”, adds Veneziani. The Converting CLS® Multifunctional Smart Liner process consists of a thermoactivated lamination of the silicone liner on the previously printed label, protecting the print and making unnecessary laminating or application of protective coatings. Finally, to allow the application on the products to which the labels are destined, are made micro-perforations, thus eliminating the classic die-cutting with scraps. This innovative technology makes it possible to use less material and produce less waste, increasing the production capacity of the machines used, thanks to a higher speed and the elimination of the distance between labels required in case of die-cutting. More than 80% of printed labels have a square or rectangular shape, so with this technology there is no problem to meet the needs of the market. Thanks to the use of transparent material it is possible to obtain labels with a no-label-Look effect, graphically simulating any shape of the label within a square or rectangular shape. Martin Leitner, Durst, illustrated the potential and opportunities offered by digital printing: moving towards digital inkjet or hybrid technology for a printing company is not just the purchase of a new machine, but it can be the beginning of a transformation of your business model and of the company itself. From this point of view, Durst and OMET offer a solid base of expertise, sharing the same philosophy and the same objectives, essential for this evolution. To achieve quality results, all components involved in the inkjet printing process must be perfect: print heads, inks, software and materials. But all this today is no longer enough or at least having achieved such a high development, the key to impose itself on the market with these technologies is to propose new methods of work. The digital has overturned the paradigms, making possible what once was not. 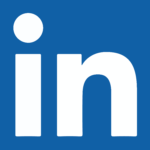 “We have a customer who uses the Tau to digitally print the labels to be applied on tires, with various data, all different from one another depending on the model. 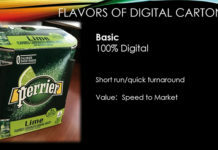 Orders are sent by the brand owner through the printer’s workflow directly to the digital press. Delivery takes place within a maximum of 24 hours after the order as tires companies do not stock and their production programs can change in a very short time, therefore for a similar type of work without a digital workflow and a digital printing press, it would not be possible to do it”, says Martin Leitner. In the last year, Durst has installed around the world 25 models of Tau 330 RSC (Resolution, Speed, Colors), characterized by a resolution of 1200×1200 dpi, speed of 78 linear meters per minute in CMYK + OVG + W configuration. 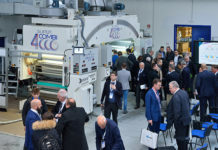 During 2019 further developments on the machine are foreseen with the possibility to realize digital screen printing and therefore increase the tactile effects of printed materials and an increase of opaque white up to 80% to the speed of 39 meters per minute. 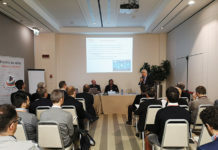 Francesco Niorettini, Italgrafica Sistemi, talked about his personal case study as first XJet user in Italy. 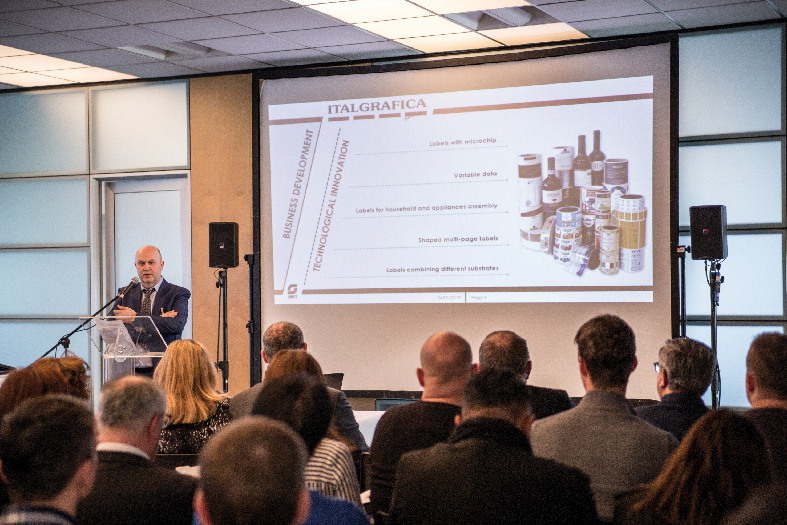 On the market for 25 years, Italgrafica sistemi is part of the Konig Print Group together with ElleGi Trento and KPS, employs about 70 people for a turnover of 12 million €, and specializes in printing of self-adhesive labels. 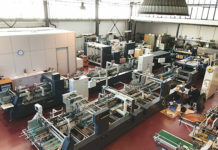 Historical customer of OMET (3 flexy-S 330 and a Xflex X6), when it was time to choose which hybrid technology to invest in, Italgrafica had no doubts, as confirmed by Francesco Niorettini: “our challenge is to make longer runs in digital mode and the XJet is a unique solution, able to combine the best of the worlds OMET and Durst: an investment in innovation that has allowed us to raise the bar at a technical and professional level”. 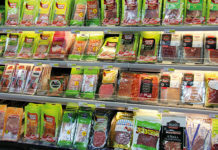 The production of Italgrafica in the field of self-adhesive labels ranges from variable data, to labels with microchips (RFID, tags), to multi-page solutions up to labels combined with different substrates. After a first experience with a digital machine whose breakeven is set at 2/3000 meters, it was necessary to rely on a hybrid machine, more performant from the production point of view with a higher breakeven, 15/20 thousand meters which are important runs. 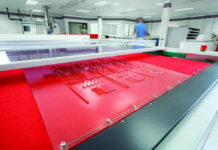 “Another advantage of hybrid technology is the ability to print any type of work without the need to apply the primer. In our warehouse we have about 150 different materials, including special ones for wines or metal foils, and I can confirm that almost all of them are printable in both conventional and hybrid technology. Even from a quality point of view, we are used to printing in high quality flexo and offset, and here too we have been largely satisfied with the results we can achieve with hybrid printing”, concludes Niorettini. Articolo successivoHow “Brite” is your White?